It's been a long time coming and I can finally say these words: the second season of The Walking Dead is FINALLY here! 400 Days was a nice distraction to keep many from losing their minds over the lack of more TWD, but the true sequel has arrived and it does not disappoint. News spread fast concerning the second season's details and it came as a shock that players would be in control of Clementine, the little girl who narrowly escaped being a hostage and death thanks to Lee Everett, the former protagonist. Those of us that played the first season as well as 400 Days and did not delete the save file can import decisions made into this season. What these decisions affect I cannot say to avoid spoiling important details. Even those of you who have not yet played the previous episodes can start on season two. The game will randomly choose decisions if a save file is not present. "All That Remains" is only just the beginning, but it starts off with a great emotional pull and ends with the cliffhanger that has people craving for more. The Walking Dead "syndrome" is back in full effect and could even be worse this time around. Clem alone by the fire. We aren't controlling a grown man, who could deal with walkers or people. Clementine is still a little girl who could easily be overtaken by the wrong element. This becomes apparent in the first few minutes of the game and made me carefully decide on my future choices. Speaking on personal choice, The Walking Dead still focuses on survival in a world destroyed by the zombie apocalypse, and with surviving comes choices... lots of choices. Do you befriend a stray dog that could be an asset to you? Be nice to a girl you only just met or treat her like a stranger? I tried to fall in line with how Clementine might react with certain situtations but I've known people to be a real jerk with her. This game isn't completely open to how you want to shape it however. To a certain extent, the game is still considered linear because one way or another, something does happen no matter what choices the player makes. The biggest question I get from people who haven't played yet seems to be the most repeated: "What makes it different from season 1?" The truth? Not much besides the new story, characters, and the updated interaction prompts. I could play seasons 1 & 2 with someone who hasn't played either, and they would most likely think both are the same thing. Besides the subtle differences like having to push the analog stick in the desired direction during some truly tense moments, season 2 is almost an exact replica of its predecessor. Does this spell bad news? By no means do I think so, because the main attraction for The Walking Dead isn't innovation on a massive scale in terms of gameplay but the story that drives emotions home. If you're coming into this without having played the original season, major hints to the past will go right over your head and may not cause the same reactions from someone who has. Speaking as someone who has played season 1 from start to finish, there were plenty of moments where I felt the emotions rising to the surface. Also, I would like to mention how the relationship between Clem and Lee isn't forced. I expected to see a lot more moments where she remenisces about her protector. Instead, the few moments she does look back on him are to the point and doesn't feel like they are being oversold. Like every episode before it, "All That Remains" ends with a cliffhanger that has people, including myself, begging for more. When the next episode comes out I cannot say, but it couldn't come soon enough. That being said, I can tell my feelings weren't on the same level as when I first beat "A New Day" for season 1. Too much of the same thing isn't necessarily a good thing, and I fear Clementine's story may fall short of the original. Alas, it is too early to tell, and for all I know, season 2 may very well surpass season 1 with flying colors. If you're looking for a completely different game, you've come to the wrong place. 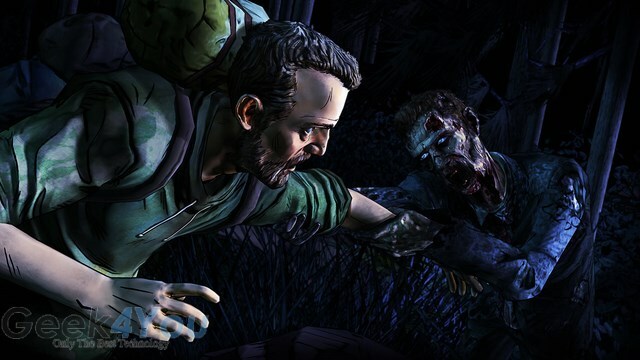 Telltale played it close to the vest with The Walking Dead sequel by leaving everything virtually the same and intact. For those mesmerized by the world crafted within, this continuation is just for you.